Concrete wall sawing is the use of a circular blade on a track-mounted machine. The track is attached to steep inclines or vertical walls that will not permit the use of slab saws. Wall sawing, also called track sawing, is typically used to cut precise dimensional doors, vents and window openings. Clearance must be allowed for the diameter of the blade. An adapter may be attached to the saw to achieve flush cuts. 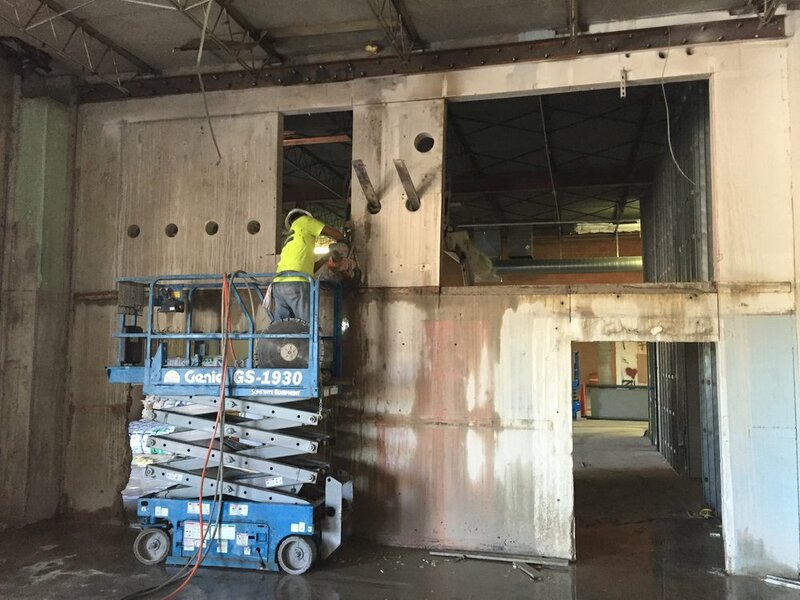 Marek Sawing & Drilling, LLC is experienced in many wall sawing scenarios. Cored chain sawed corners can be used to prevent over-cuts caused by the diameter of the saw blade due to wall thickness. This protects a structure's integrity. Cores through the middle of the sawed section can be used for easier removal of the panel. Hydraulic, electric, hy-cycle and air techniques can be utilized to cut precise dimensional doors, vents and window openings in enclosed spaces to keep the air quality safe for those working in the building.